It’s like finding a stash of doubloons. ‘Strike it rich’ radiates deep golden yellow blushed with a bits of ruby red. The strong fragrance suggests spice and fruit. 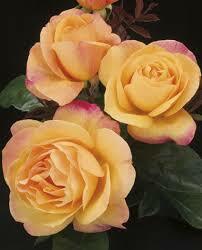 A true Grandiflora that blooms in clusters on long stems that are suited for cutting. Great disease resistance. Golden-yellow, pink shading. Moderate, fruity, spice fragrance. 30 to 37 petals. Average diameter 4″. Medium, full (26-40 petals), cluster-flowered, in small clusters, cupped bloom form. Prolific, continuous (perpetual) bloom throughout the season. Long sepals buds. Tall, upright. Medium, semi-glossy, dark green foliage. Height of 5′ to 6′ 7″ (175 to 200 cm). Width of 20″ to 26″ (50 to 65 cm).